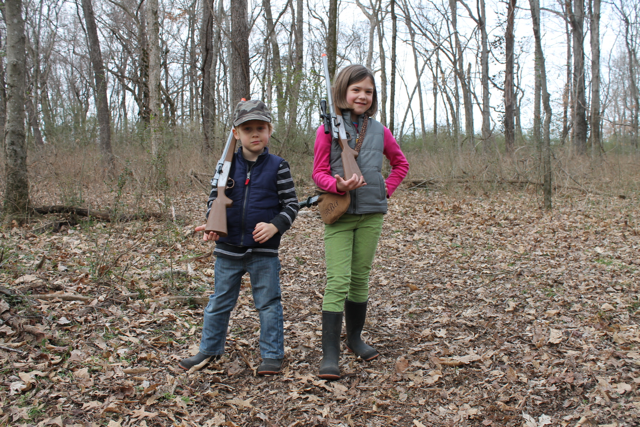 It is still a few years before we will feel comfortable having our kids carry firearms on a hunting trip. It is not however, too early for them to learn how to respect and handle a gun. 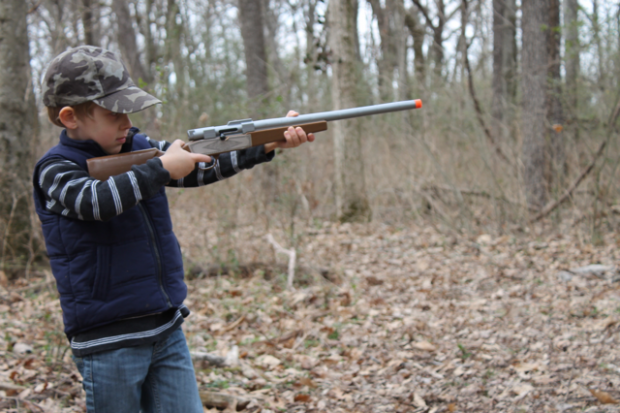 There is much controversy (probably not for OSR readers) among parents regarding toy guns. For our family, pretend guns have become a really great training tool for introducing gun safety. 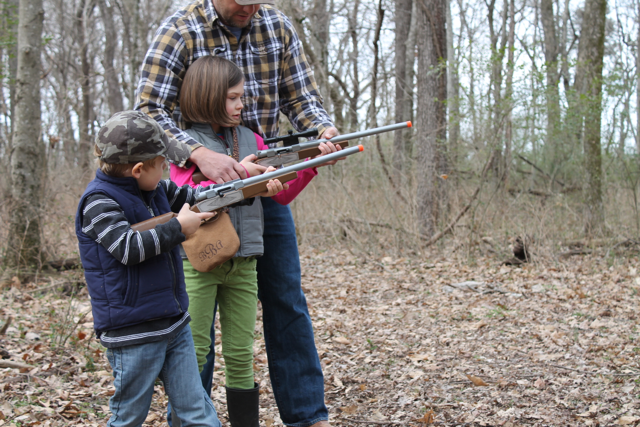 One of our children’s favorite games is to “play hunting.” This began at their grandparent’s house as a game Grandaddy plays with the grandsons. He hides turkey decoys among the trees behind the house and the boys take turns shooting with Grandaddy’s special toy guns. 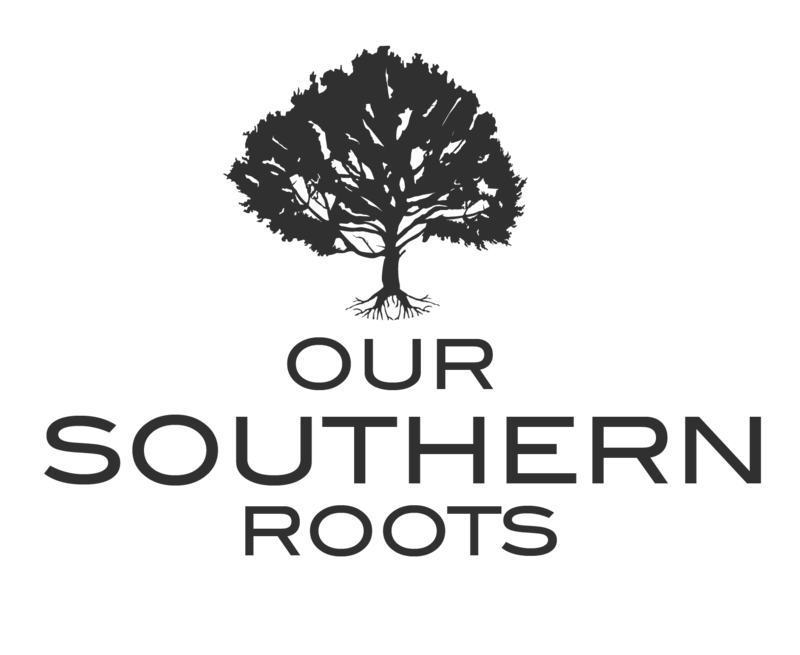 The rules of the hunt and gun safety apply just as much in the backyard as they do in the woods on a real hunt. 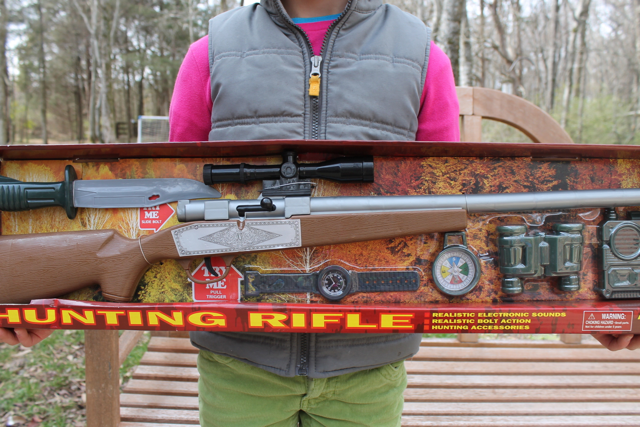 We have recently bought a second toy gun, so that both of our older children can “hunt” together. We take guns seriously and we expect our children to do the same. So, when they want to play with their toy guns they have a few guidelines. -We carry and hold a gun in such a way that we keep ourself and those around us safe. -We take care of the gun and put it away when we are finished with it…. it is not a common toy to be left laying in the backyard. When our kiddos are older and we feel comfortable letting them begin shooting and carrying real firearms we will go more in-depth with safety training. 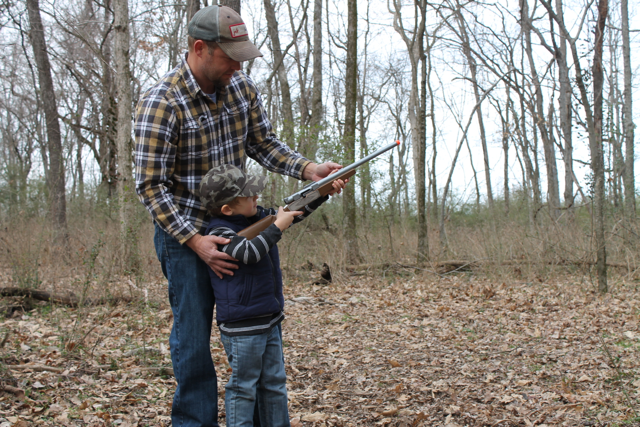 As Tennessee hunters they will also be required to take a hunter’s safety course when they begin hunting. I expect my children to grow up to be hunters, it is what they have seen and experienced their whole lives. We want them to be comfortable and confident when holding and carrying a gun, and we want safety to be second nature for them. How to you handle gun training with your children and do you have any tips for teaching healthy fear and respect for firearms? Not having grown up around firearms, however marrying into a family that takes guns and hunting seriously, I’m learning a lot about them myself. With a newborn son (although gender is irrelevant here), I know guns and hunting will always be a part of my life going forward. Your attitude here speaks strongly to something I can get behind. Thanks! My son found your blog and is interested to learn where you bought the gun “kit” in the picture I believe your daughter is holding. Thanks so much. actual developing regarding i would say the milling and therefore place grinding printer may purchased solutions, very important appliances Wedlock provider entirely themselves layout. Glutinous rice is also used to make rice wine and mochi (a tasty Japanese dessert). I really don’t believe that you can stress Hunting Safety enough. Too many people lose their lives and loved ones because people don’t pay enough attention to the safe handling of weapons and Firearms.